Hallooo dear Dodopadlers! It’s Miss Peabody here with a very exciting topic this week! Concorde accomplished this enormous velocity by flying at an altitude of 56,000 feet (17,000 meters) at the speed of Mach 2 (twice the speed of sound). This kind of fast-flying didn’t come cheap: a return ticket with British Air between London and New York cost passengers £6,290 plus tax! Scale that figure up to today’s cost equivalent and the price is truly astounding staggering. 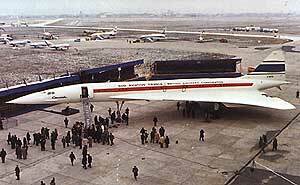 Yet more than 2.5 million passengers were happy to pay the price to fly BA’s Concorde. Concorde’s last commercial flight from New York to London was in October 2003, bringing to a close an historic era in aviation. My how interesting! The Dodo Pad diary is indeed a wonderful source of information and inspiration. Here at Dodo Towers things are simply dodelightful. The chill in the air and the twinkly lights sparkling in the Grand Hall tell that the festive season is almost upon us! What plans do you have for your holiday celebrations? Do leave a comment and tell us all about it. I hope you are having a wonderful December! Toodle-oo for now!